SKU: N/A. Categories: Amino Acids, BOGO. Don’t get fooled by other BCAA ratios, 10:1:1, 8:1:1, and so on. 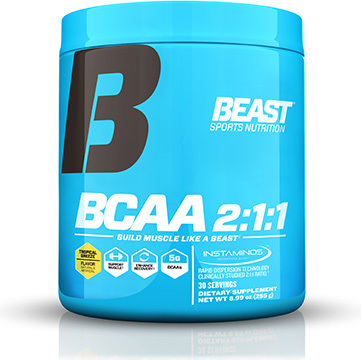 The 2:1:1 ratio of BCAAs used by Beast remains the most scientifically tested and proven. (It also closely matches the ratio of BCAAs in real muscle tissue.) All of the amino acids in Beast BCAA 2:1:1 are present in doses that make a difference – no “window dressing” here.